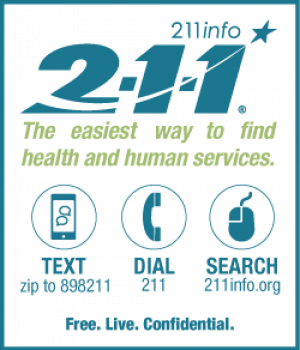 2-1-1 is an easy-to-remember, toll-free phone number that connects callers with local community services such as food, shelter, counseling, employment assistance, elder care, legal help, and more. Rather than spending hours searching the Internet or calling numerous numbers, simply dialing 2-1-1 is an efficient and convenient solution. 2-1-1 is FREE, confidential, and live Monday through Friday from 8:00 a.m. to 6:00 p.m. Your call will be answered by trained specialists who live and work right here in Oregon, so they understand the needs of Oregonians. ​Answers are also available 24/7 on the 211info Web site. Up-to-date software systems make it easy to share database information across regions while reserving local control over resources and partnerships. During a disaster situation, 211 provides critical information about evacuation routes, food and shelter, as well as support during long-term recovery.